In this week’s episode, Luke & Jed are joined by newly crowned DragRaceResults.com Ultimate Series champion Aaron Vail. The longtime Indiana door car driver tells the guys what it’s like to take a dragster home for the first time. In addition, IHRA crowned its sportsman champions last week with the Dragway 42 Finale, so the guys discuss that. 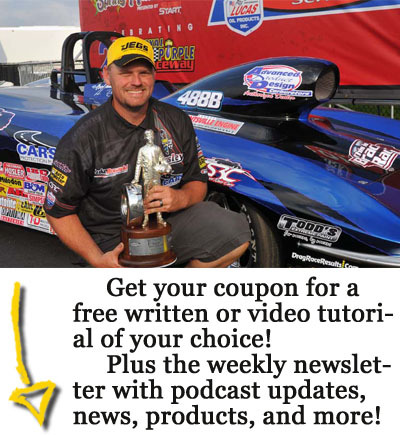 Plus, they cover the NHRA action from Maple Grove and Rocky Mountain Raceway, as well as the DRR Series’ final stop in Huntsville and the Jim Harrington Memorial Classic at Cecil County. It’s an action packed show, recorded from the tower at Bristol Dragway during the Fall Fling! Next Next post: Episode 046: Catching up with the man of the hour, Troy Williams, Jr.